There is a nice, not difficult route to hike from the B&B. This walk passes a number of Spanish holiday homes and goes through untouched nature. You can climb to a mountain top where, with a bit of luck, you can spot vultures and have a great view of the surrounding villages and mountains of Andalucia. You pass various ruins, where families with 10 children, or even more, used to live. It’s a walk through lovely rolling countryside interspersed with pieces of rugged rocky terrain. Wild boars, foxes, various birds of prey, mountain goats and butterflies live here alongside the vultures. This is a varied hiking route of about 2.5 hours and it’s advised to take a walking stick for the climb and the descent of the mountain top. We have Nordic walking sticks available. Ask for the route description. If you walk further up the unpaved road of the B&B, you will reach a gate with a lock but there’s a gate on the right which is open. You can then walk over the terrain where the horses are kept. Continue on the unpaved road and at the end of this path you will reach another unpaved road. Here you turn right and after about 50 metres you will see a “rustic” fence. Go through here and take the goat path on the left (both paths lead to the same terrain.) You see a ruin and from here you can follow the paths which used to be part of the route the smugglers’ took with coffee and cigarettes. In this hilly landscape you can wander for hours without seeing anyone. We do not have a map or route description for this area but nowadays everyone seems to be able to get along with Google Maps on a mobile phone so you can walk the route the way you want to. In the time of Franco, a man from the village hid for years in the rock caves to stay out of the hands of the Guardia Civil. 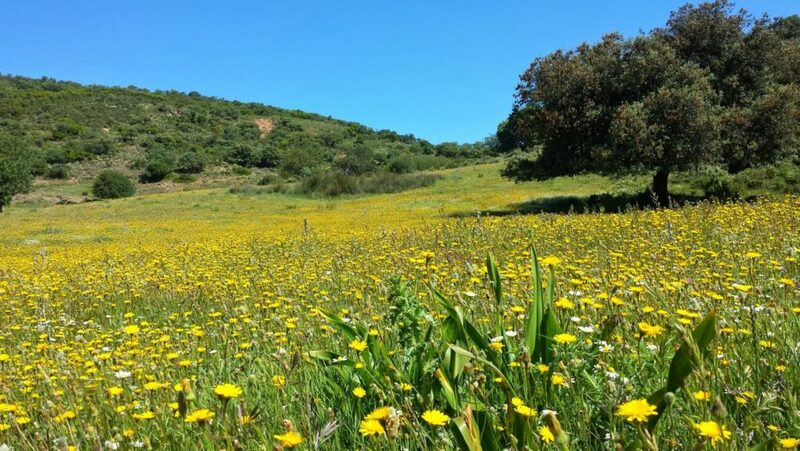 El Lute, an important freedom fighter of Spain, also roamed the hills of this nature reserve. There is a wonderful book written about him, “El Lute” which you can borrow at the B&B. 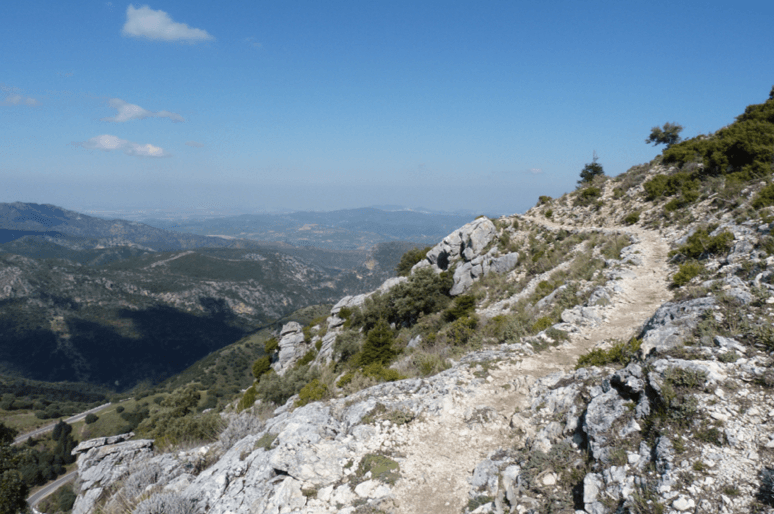 Hiking trails in the Sierra de Grazalema nature reserve, the most beautiful area of Andalucia. 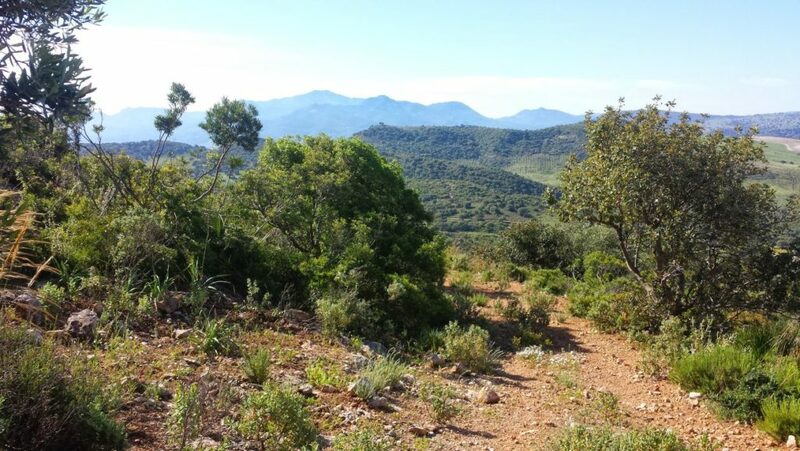 The spectacular trail Garganta Verde, which means “green throat”, hides a natural cathedral, an immense magical space. To get there, you descend a natural path into the rocky gorge. This gap is the habitat of one of the largest colonies of griffon vultures in Europe. The scavengers have a wingspan of two and a half metres and you can hear them when they fly just above or below you. Because it is located in a protected nature area, you need a permit for this walk. You can get it at the Sierra Grazalema information centre in El Bosque. From June 1 to October 15, the walk is only accessible up to the viewing plateau. A nice surprising trail from El Bosque to Benamahoma alongside a river with crystal-clear water. You walk through a fairy-tale forest with many bridges and steps on the way. There’s a lot of welcome shadow on this trail and who knows you may come across an otter. The hiking trail is 4 kilometres (about an hour) and you can either walk back or take a taxi. There’s a noticeboard giving the taxi phone number at the end of the route. This is a high-altitude hiking trail with stunning views of the highest mountain peaks of the province of Cadiz, such as El Torreon and El Reloj. What is really special about this area are the limestone formations with their sharp edges, carved out caves and alleyways. A perfect habitat for the wild mountain goat. In addition, you will be surprised by well-preserved lime kilns, threshing floors and water bins. This tour starts at the parking lot of the camping site Tajo Rodillo of Grazalema, and takes about 3 hours. The difficulty level is average. From Zahara de la Sierra you can approach the other side of the Garganta Verde. Here you can walk for an hour in a narrow canyon, Bocaleones, which means “lion’s mouth” and wade through the water. In some places, the ice-cold water reaches to the chest. A spectacular walk on hot summer days. From Toleta you can walk on the goat paths next to the river. You might encounter the turtles. They sunbathe on the warm stones on the bank of the river Guadalete and as soon as they spot you they splash into the water. The shepherd passes this way with his goats and if you keep look carefully, you can see the tracks of wild boars. You walk back over Via Verde and pass a couple of tunnels. Nice quiet walk of 2.5/3 hours. The start (Toleta) is 20 minutes by car from the B&B. Ask us for the route description.